The investments made to design and propose the CorText digital platform had major implications for IFRIS. Ensuring the development of research on science, technology and innovation in society requires that the challenges of building, processing and analysing increasingly prolific and varied sets of digital data are met. As the notion of Digital Humanities indicates, it has become important today to take advantage of the increasing number of digital databases which allow large-scale exploration of scientific and grey literature, of the production and management of scientific data, of patents, press articles, the blogosphere, etc. This abundance of digital data is worthwhile only if new methods for exploring and analysing it can be developed in line with the issues studied by social and human scientists. These methods aim to improve the articulation between the qualitative and quantitative approaches by enabling large quantities of data to be managed without undermining the quality of the analysis. They are also the fruit of design by use and are applied either collectively or individually within research projects. The digital platform’s main asset is that it has been tried and tested during three years of collaboration between the humanities and social sciences, information technology, complex systems theory, and methods of natural language processing. LabEx SITES allows the efforts made since the creation of IFRIS to be furthered and amplified thanks to two complementary projects: the CorText platform and the “indicators” pole. 1/ The development of a certain number of basic tools, which are today grouped together within a single tool called CorText Manager, accessible online. The advantage of these tools is that they are generic and rest on original algorithms which allow dynamic and multi-scale analyses to be carried out. The use of these tools was first demonstrated during a competition on “Big Data” organized by the United Nations in New York. 2/ Experiences of partnership on research projects in the humanities and social sciences, in which the platform’s tools were used. The subjects are widely diverse: the analysis of the forms of “online sociability”, knowledge on orphan diseases, the controversies surrounding green algae, the structuring of fields of research (e.g. nanotechnologies, bio-energy, agro-ecology, etc. ), the emergence of technological promises such as synthetic biology, etc. Its most noteworthy achievements are the production of a Corporate Invention Board (which was launched in December 2009 and which should be completed by a Corporate Scientific Board) and of a global map of technology. 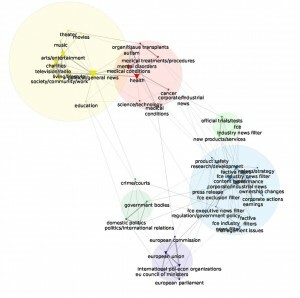 Like the CorText platform, the Indicators Pole is also versed in methodology work regarding the delineation of corpuses, methods for visualizing results, and issues regarding clarification and unification of the names of the actors in research. For more information on the platform, please visit the CorText website.